New Page Books, 9781632650818, 192pp. As the dying prepare to leave this world, they often begin to get a glimpse of what lies beyond through deathbed visits from deceased loved ones, strangers, and angelic or divine figures. Religious beliefs appear to have no bearing on these experiences--even atheists and nonbelievers have reported such phenomena. At times these visits are experienced by others in the room, offering incredible validity to the idea that life truly does continue. Present substantial evidence--perhaps the most compelling to date--that we do not die alone. "What happens when we die? This is one of humankind's most important and enduring questions. A Call From Heaven brings a fresh and exciting perspective to this ancient question. Josie Varga presents a superb look at deathbed visions, which are the glimpses of the afterlife reported by those dying. With each turn of the page you will find a treasure trove of insights and inspiration. This outstanding book is expertly written, remarkably easy to read, and enthusiastically recommended." 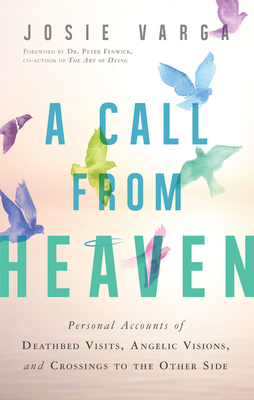 "Combining scientific and medical research with moving and emotional testimonials, A Call From Heaven offers undeniable evidence of what we may experience at and after death. This book educates, empowers, and inspires us to look beyond our fears of the unknown to recognize that what we perceive as an ending can truly be a beginning. A must-read that will change your perception of what it means to die."